Those of you familiar with labneh are now racing to the bottom of this article to find where you can get your hands on it. For the uninitiated, I shall explain. Lebnah is a Middle Eastern yogurt cheese. Basically, think Greek style yogurt but even more strained. Thick, almost a cream cheese consistency, rich and tart and heavenly tasting. It's usually drizzled with olive oil, seasoned with za'atar (more on this wonderful spice soon) and served as a dip with pita bread. It was many years since I'd had it but I never forgot. A few weeks ago my friend, Treva, introduced me to the spice market at Kalustyan's, an unassuming store located near a curry house on the lower east side of Manhattan. I probably would have walked right past it but that would have been a huge mistake because inside is nirvana. Every spice and exotic ingredient you can think of and a refrigerated case with labneh! I practically shoved an innocent woman out of the way to make sure I grabbed as much as I could carry. When I finally finished it all, I was bemoaning that fact to my friend, Susan, who writes The Girl in the Little Red Kitchen and she directed me to her homemade labneh recipe. Ever since then, my refrigerator has been filled with various bundles of Greek yogurt, wrapped in cheesecloth, dripping away into bowls and becoming labneh. My life is much happier now. And since I no longer had to horde my precious stash, I was free to experiment with using the labneh for something other than just shoving it into my mouth as often as possible. And now my life is even happier still because it makes a wonderful cheesecake. 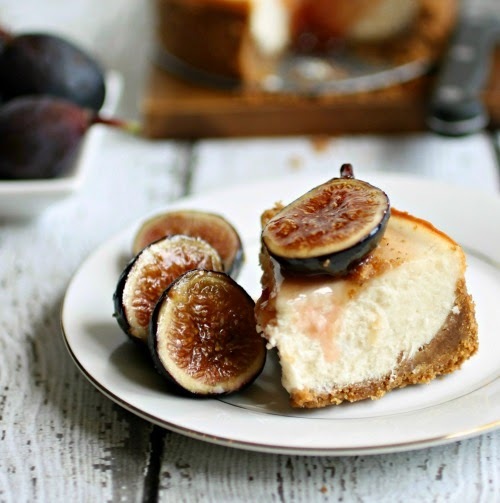 A little tangier than what you'd get with cream cheese but the perfect foil for the candy-like honeyed figs. Sweet and tart and addictive. Enjoy! To make the crust, add the graham crackers to a food processor and pulse until you have crumbs. Add the salt and melted butter and continue pulsing until it's incorporated. Press the mixture into the bottom of either an 8" spring-form pan or two 4" ones, as I've used here. Set aside. Use a paper towel to wipe out the bowl of the food processor and add all the filling ingredients. Puree until completely smooth and pour into the prepared crust. Bake in a pre-heated 350 degree oven for 30 minutes and allow to cool completely, or overnight, before removing from the pan. When ready to serve, prepare the topping by adding the sugar, honey and water to a sauce pan. Heat on medium just until the sugar dissolves then add the sliced figs. Continue to cook on medium for about 5 minutes, stirring occasionally. Remove from the heat and let stand for another 5 minutes to thicken slightly. 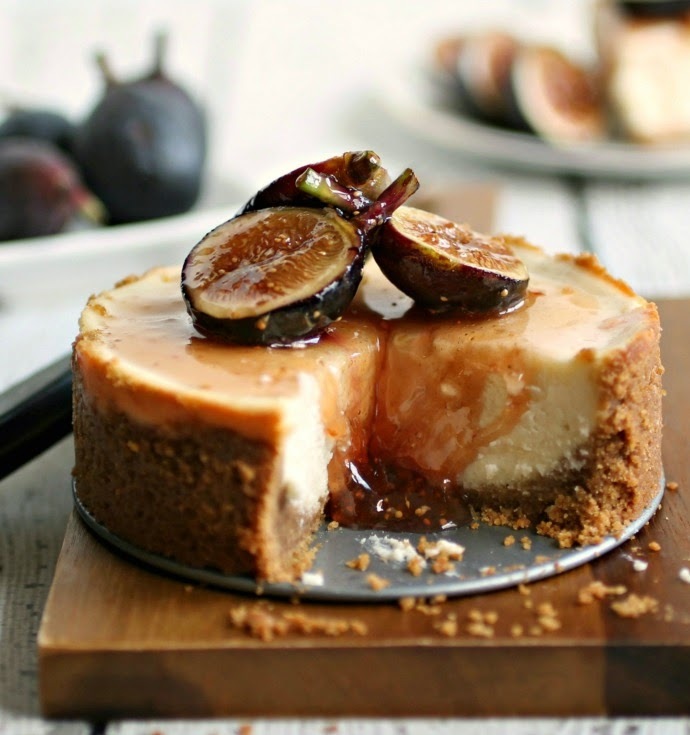 Place the figs on top of the cheesecake and pour on the honey sauce. Makes approximately 8 servings. It's just stunning, Anita. Absolutely gorgeous! And now I need to try labneh... Yet another thing on my list thanks to you. 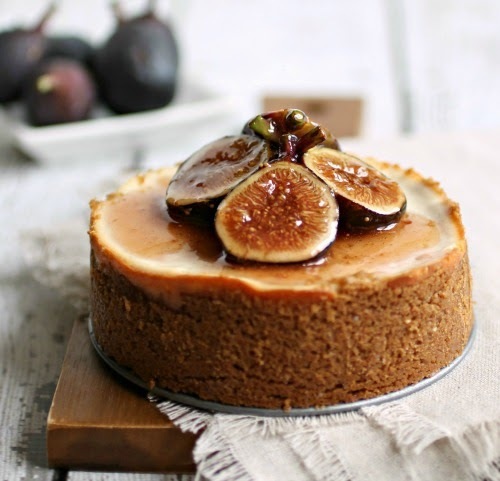 Fabulous looking cheesecake too. i live in OK, if i cant find labneh, can i sub cream cheese? Hi Debbie - You may use cream cheese although it will not have quite the same lovely tang as the labneh. Even if you can't find it, I encourage you to check out the link above for an easy way to make your own. Oh, I'm well aware of that, Stacy. :) I'm a huge lover of Middle Easter food so, in that respect, I'd be quite happy there. As much as I love Middle Eastern food, I've never tried labneh before. Crazy, right? And to turn it into cheesecake? Genius.